Many young Canadian designers are outraged that the federal government has asked them to work for free. Many young Canadian designers are expressing outrage that the federal government would ask them to work for free. The Association of Registered Graphic Designers (RGD) has launched a campaign to boycott the Canadian Heritage ministry's competition to find a logo for Canada's upcoming 150th birthday in 2017. Anchored with the hashtag #MyTimeHasValue, the campaign seeks to highlight how design competitions have become a means for companies and governments to obtain free work from designers, particularly when they're young. The logo competition is open only to post-secondary students. While the creator of the winning logo will receive $5,000, RGD president Stüssy Tschudin says that doesn't even begin to be fair. "Imagine 500 students enter the contest. Each student spends 10 hours on a design, which totals 5,000 hours of work. At minimum wage in Ontario ($11), this amounts to $55,000 worth of free labour," said Tschudin in an email. "The fact that one of those students will receive a prize doesn’t negate all of that other free labour." @canada150th way to completely undermine the design community in Canada! You know I'm a professional designer right?! #MyTimeHasValue. Asked whether RGD has a point regarding unpaid work, Heritage Minister Shelly Glover's spokesperson provided a statement to HuffPost Canada. "Canada’s 150th is for all Canadians. The Canada 150 Logo Challenge is an effort to engage youth in Canada’s history and to encourage them to celebrate our country’s birthday," said Marisa Monnin in an email. "We have tremendous faith in our youth’s creative excellence." Tschudin wishes the government had been more creative and fair in highlighting the "achievements and talent of Canadian youth." He suggests the feds could have identified a group of students via their schoolwork and connected them with professional design firms. Everyone could have been compensated. The government could then have showcased all of the designs as part of the birthday celebrations. The students would have gained valuable experience and exposure as well as the more traditional value provided by money. "There are so many ways the government could have involved students in this project while ensuring each of their contributions was valued," said Tschudin. "It’s unfortunate that the process they chose has each student working in isolation, without any real engagement, any feedback, any opportunity to gain from the experience or have their work seen or celebrated by anyone." Graphic Designers of Canada, which grants certification to designers, is also against the competition. The group has launched a petition calling on the government to shut down the competition and implement a process similar to that suggested by Tschudin. The petition has more than 5,500 signatures and has gained the support of NDP Leader Thomas Mulcair. "The current contest process risks taking advantage of students by undermining the value of their design work, Mulcair said in a statement. "This is certainly not the legacy Canadians would want for such a joyous and historical event." Canadian Heritage has actually already run at least one major focus group looking for a birthday logo. In 2013, Heritage paid $40,000 to focus-group five logos that the department created in-house. The proposed logos created by Canadian Heritage. The designs received mixed reactions from Canadians, but many professional designers were even less impressed. Some of them banded together to offer up alternative logos. The current competition is actually an echo of the process used to find a logo for Canada's 100th birthday. However, that contest failed to yield a usable design and the government eventually turned to professional firms. Stuart Ash, who designed the logo that was eventually used, thinks turning to a competition once again is a mistake. "Canada has come a long way since those early years in the 1960s where design was merely considered an 'applied art,'” Ash said in a statement. "Through the efforts of a large and talented design community we have evolved into a highly skilled and specialized profession." Speculative work has become extremely controversial in the design industry. A video that went viral in 2012 highlights how other professionals would never accept a speculative work model. "Could you hold a contest and get hundreds of lawyers to write your will and then only pick and reward one?" the video asks. The #MyWorkHasValue campaign has taken off online, with many young people expressing their frustration about being asked to work for exposure and just the possibility of pay. It's sad that @canada150th has to be reminded that #MyTimeHasValue. Spec work is not cool. You pay a dentist, a lawyer, and a designer. #Canada150#MyTimeHasValue Sad that our government would disrespect us as designers. We will not work for free! Others see the contest as another example of government excess and incompetence. The #mytimehasvalue campaign is just another example of how much the Canadian Public Service is out of touch. Shame. But not everyone thinks the contest is a bad idea. 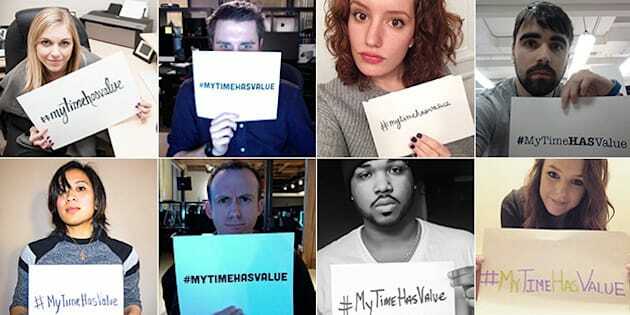 I agree w/the #MyTimeHasValue movement except its a contest for $5000. And they're just students. For professionals its a different story. This is not the first time the government has become embroiled in a debate over unpaid work. Late last year Bank of Canada governor Stephen Poloz suggested that young Canadians struggling to find work should look to unpaid internships and volunteer work to gain more experience. His comments sparked outrage on social media and the government soon distanced itself from Poloz's remarks. Federal Employment Minister Jason Kenney said soon after that the comments sent the "wrong message." Kenney suggested that it's better for youths to take paid positions to gain experience and that employers need to take more responsibility for training students.